William (Billa) and Thomas were part of a well established Porthcawl family of four that hailed from Philadelphia Road. They attended The National School on Lias Road ( The Co-operative today)up to the age of 12yrs old and then studied law at Porthcawl College, which is now the Seabank Hotel. After school Billa became a carpenter and married Rachel Florence Hartrey from Barry. Billa was an exceptionally talented sportsman, especially in golf, rugby and cricket. Unfortunately, like a lot of men of his generation Billa’s sporting career was interrupted by the Great War. Yet, during his training at Chatham he played cricket for the Depot. Nevertheless, the war took over the next four years of his life. He served at Ypres with the Royal Engineers but later transferred to the Yorkshire Regiment ( The Green Howards) with whom he went over the top at Passchendale in 1917. 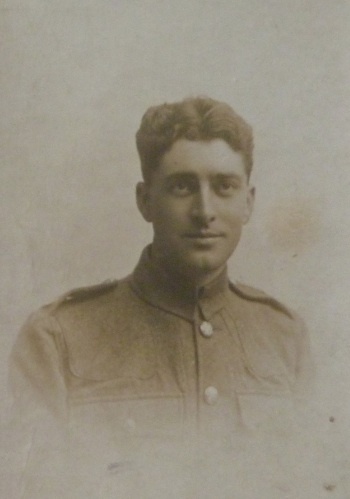 Despite being hospitalised twice during the conflict, Billa made it home and became a founder member of the “Comrades of the Great War” which eventually became the British Legion; Porthcawl Branch. After the war Billa resumed his golfing career. 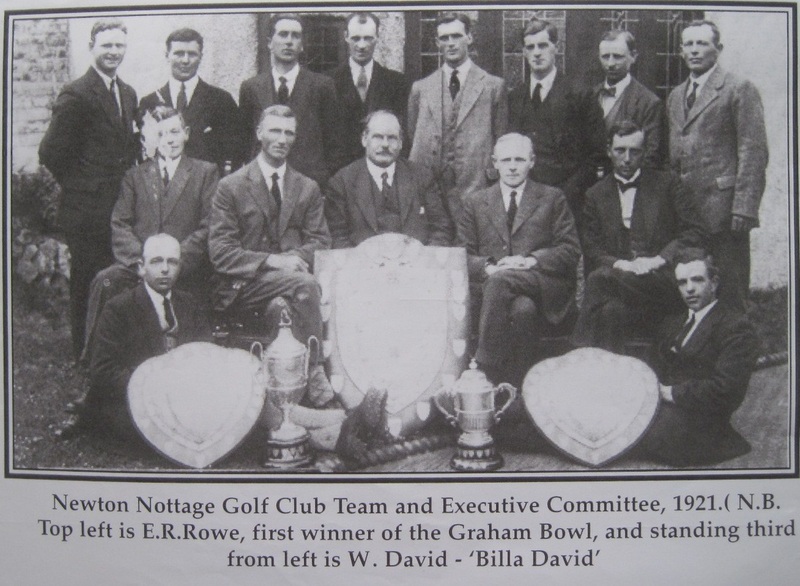 On 9th October 1919, saw the opening of the Newton Nottage Golf Club. 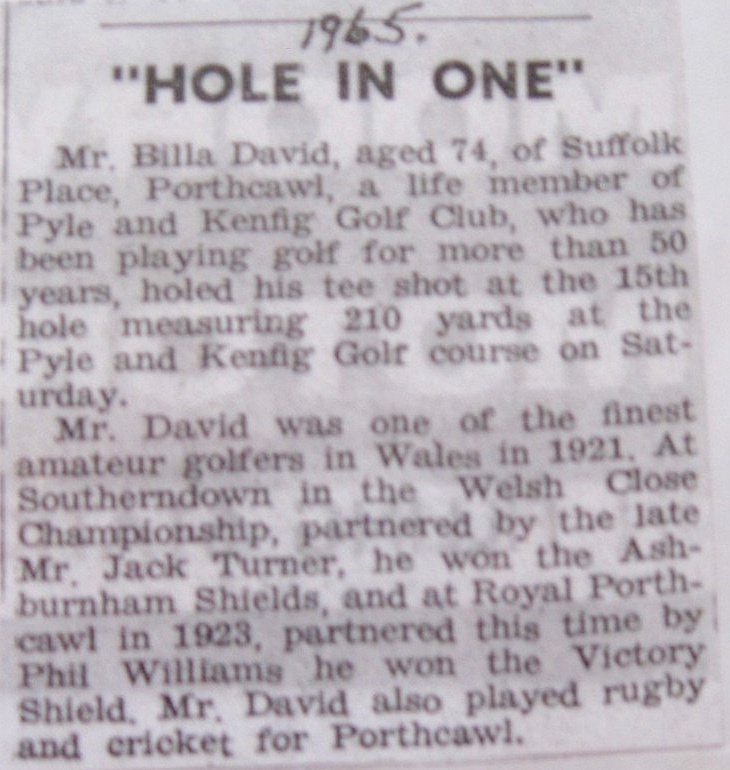 A four ball match, over 18 holes ,was played between Mr R.F Orr, past captain of the Porthcawl Golf Club (now the Royal Porthcawl Golf Club), Mr Cyril Gray of the same club and Mr W.David and Mr Edgar Rowe of the newly formed Newton Nottage Club. Despite being dormie 2 the match was halved through Porthcawl winning the last 2 holes. 1922 saw the demise of the Newton Nottage Golf Club and the emergence in its place of The Pyle and Kenfig Golf Club at Maudlam. Billa won the P&K Club Championship four times -1926,27,28, and 1947 at the age of 57 yrs. Billa , was, also, a very good bowler and played regularly for the Town’s Cricket Club and for the Chatham Depot during the war. Alongside his sporting career, Billa joined the Porthcawl Fire-Brigade, part-time, whereupon he attended the Blitz over Swansea in 1940. He became a sergeant in the service and, went on to be presented with a long service medal for 25years service in the Auxiliary Fire Service. H.M. Coastguard , also, recognised his loyalty and dedication to the Coast Life Saving Corps with a 31years long service medal. During WW2 he worked in the Royal Ordinance Factory in Bridgend where his skills as a carpenter and the experience that he had gained in areas of public service proved invaluable for those around him at such a difficult time. William “Billa” David gave an immeasurable amount to our town in both sport and public service. A man, of which,Porthcawl can be very proud. Yet, it was not until he was 74 that he bagged his first hole in one at the 201 yd 15th hole at P&K; and you cannot help but imagine that this gave him as much delight and satisfaction as any other achievement in his life. 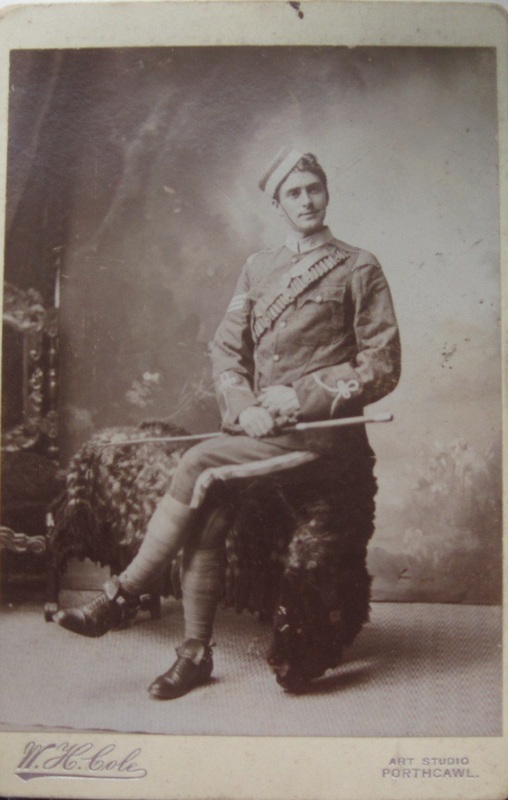 Corporal Tom David of the Glamorgan Imperial Yeomanry 1908. 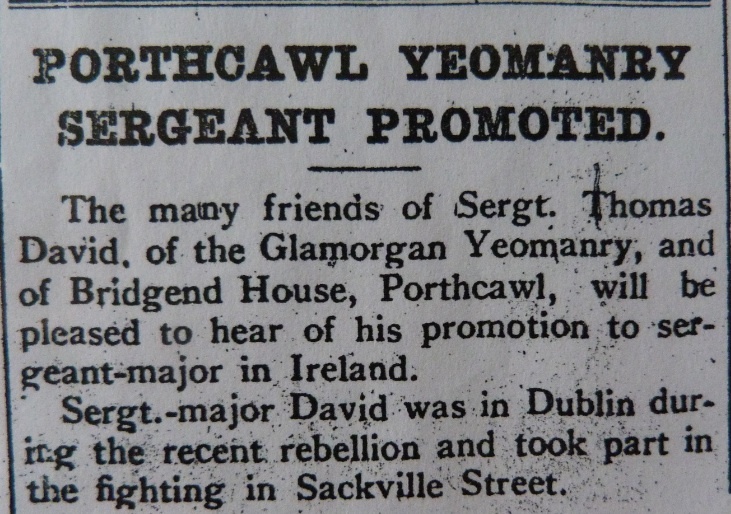 He was one of the first local men to join the Glamorgan Yeomanry (Bridgend Squadron)on its inception in 1908. Although his term of service had expired he re-enlisted on the outbreak of the First World War. 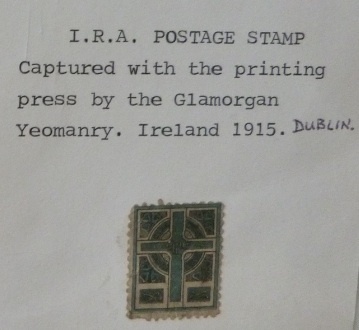 In December 1915, having been transferred to the 6th Cavalry Reserve Regiment, he was posted to Ireland to help contain the Sinn Fein Rebellion which led to the Easter Rising of 1916. Tom was present in Sackville Street (O'Connell Street today)when the Irish republicans, which included Michael Collins,seized the General Post Office and proclaimed the Irish Republic. 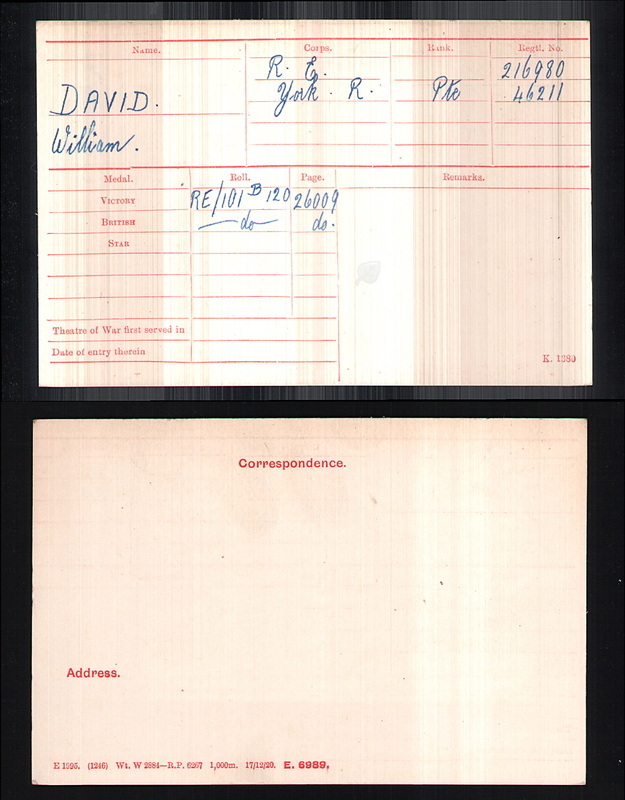 Tom arrived home from Ireland on 22nd December 1916 hoping to spend Christmas at home but on the following morning he received a wire instructing him to proceed immediately with the Welsh Regiment to Southampton for embarkation to France. On 31st December 1917 having endured many hardships in battle, Tom arrived home. He was gassed early in the year and had spent time in hospital. Unfortunately, his health never quite recovered and he suffered for many years from the effects of mustard gas.Despite this handicap, Tom continued to contribute to life in Porthcawl. Many ex-servicemen's clubs and organisations came into being after the war was over.In Porthcawl the club was called "The Comrades of the Great War." The Club was formally opened in March 1919 in Esplanade Terrace. Mr Tom David became its first secretary. Within a couple of years, such clubs became part of the newly created British Legion organisation formed in 1921. Porthcawl's branch of the British Legion was officially formed on 24th January 1924 and met at the Y.M.C.A ,John Street.Tom David remained as a member of the committee.The President was Mr T.G.Jones,whose brother-in-law Corporal Harry Maxwell died in the war, and the Chairman Colonel William Dowdeswell,whose son 2nd Lieutenant Horace Dowdeswell died during the 3rd Battle of Gaza in November 1917. The mother of another Porthcawl war casualty 2nd Lieutenant Franklyn Rowland Rowlands founded the Women's Branch of the British Legion in Porthcawl 23rd September 1924. 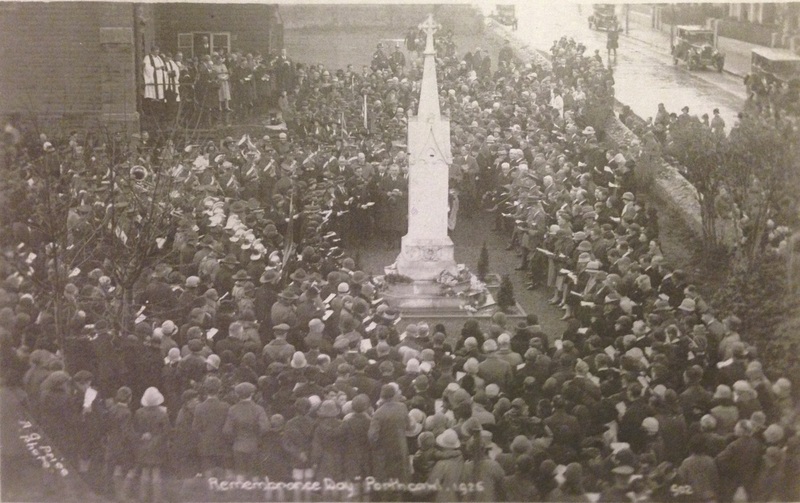 November 1924 was Porthcawl's first Poppy Day. In August 1927 the new headquarters of the British Legion in New Road (Station Hill ) were officially opened and dedicated. Mr Tom David was the Chairman of the Branch at this time. In July 1931 over 2,000 ex-servicemen from all parts of Wales, rallied at Porthcawl to celebrate the 10th Anniversary of the formation of the British Legion. Tom remained Chairman up to his death on 22nd February 1936 aged 56. His death certificate referred to the effects of gas, from his time in the Great War, as a cause. 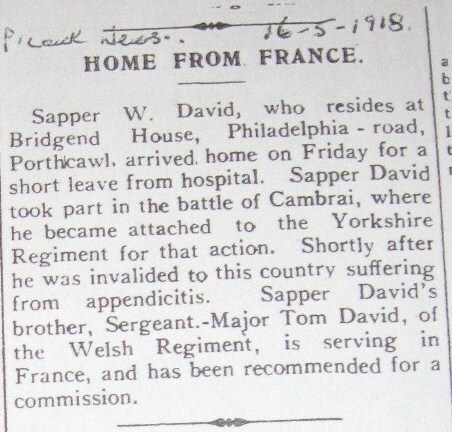 *Information and photos supplied by Mr John David,son of Mr William David, and President of the Porthcawl Museum.